Bald girl babies are especially ugly and confusing. Is it a boy? Is it human? How can we tell? Give the girl some hair. Now. Infant baldness is a serious shortcoming in your child. What are your options to de-bald your baby? Glad you asked. There are a couple. 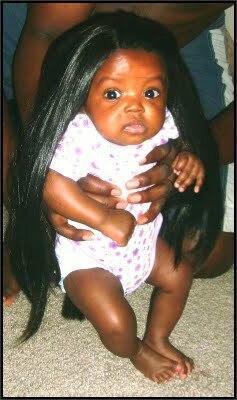 Long, lustrous locks can make an ugly baby beautiful. If your child has a small amount of hair, it’s not enough. But it is enough to give her a gorgeous weave. It can run $300-800, and may take up to 6 hours, but it’s worth it. Since babies don’t need a lot of bathing in the beginning, this fabulous head of hair is super easy to maintain. Just make sure to put it up during diaper changes. The tutu isn't fooling anyone. Give this child a head of hair and she becomes a real little girl. This poor child becomes a gorgeous little angel once she has hair. Thankfully, a company exists to make up for God’s shortcomings. 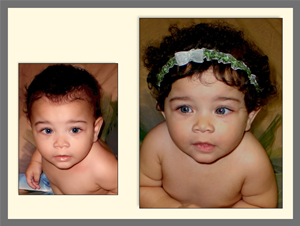 Baby Bangs are designed for infants 0-9 months, and make baby girls look pretty. More importantly, it makes girls look like real girls. Not ugly bald babies. No confusion, no fuss. Just make sure it’s not too windy out. Your child would be embarrassed to lose her hairpiece in the breeze. 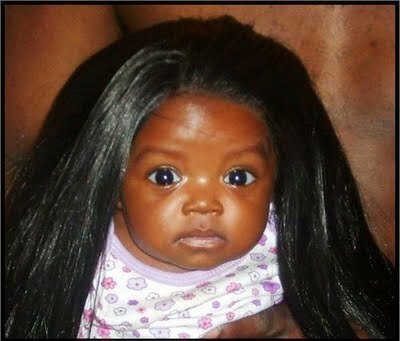 While this is a little more expensive, it can give your baby a lifetime of full-headed hair glory. However, this only works if your child has existing hair, so if she’s completely bald, use methods #1 and #2 above. If you have other ideas to combat infant baldness, post them in the comments. 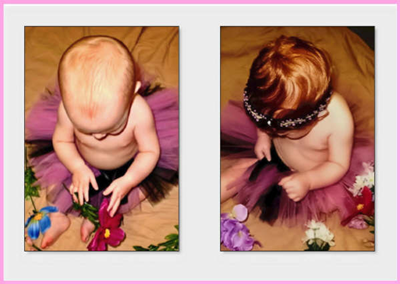 This entry was posted in Hair and tagged baby baldness, baby extensions, baby hair, bald, extensions. Bookmark the permalink. Haaaaaaaaabwaaaaah! I wish this was around when I was a baby! My granny told me that I was bald for a while when I was a baby. I bet she would have been relieved lol. Funny as hell post! Keep ’em comin’! Babies that don’t have hair or very little hair can be adorable. I don’t see anything wrong with it. But this is. But babies with a lush, full head of hair are even more gorgeous. It’s an easy problem to fix if they don’t have much hair on their poor little naked heads.